Israel is seeking to scuttle Iran’s nuclear deal with the world powers for fear of losing its position in the Middle East due to a likely rapprochement between Iran and the US, an analyst tells Press TV. “Actually, behind the rhetoric about the Iran nuclear issue, what the Zionists really fear is that a general rapprochement between the US and Iran, made possible by a nuclear deal, could lead to realignment in the Middle East to the perceived detriment of Israel and also to the growth of Iran’s influence and power,” Yusuf Fernandez wrote in a column for Press TV on Tuesday. On November 24, Iran and Sextet of world powers — the US, Britain, France, Russia, China and Germany — reached an interim deal aimed at laying the groundwork for the resolution of the West’s decade-old dispute with Iran over its nuclear energy program. In exchange for Tehran’s confidence-building measure to limit certain aspects of its nuclear activities, the six countries agreed to lift some of the existing sanctions against the Islamic Republic. Fernandez further noted that “Israel’s agents in the US Congress” are making efforts to undermine the nuclear accord. “Most US experts claim that Israel’s insistence on zero enrichment is ‘not an achievable objective’,” he wrote. 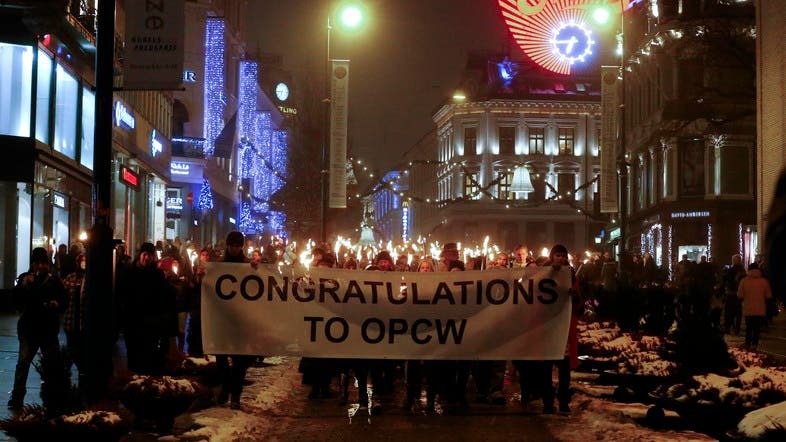 People hold torches as they wait in a crowd for Ahmet Uzumcu, director general of the Organization for the Prohibition of Chemical Weapons (OPCW), to appear on the balcony of Grand Hotel Oslo in Oslo December 10, 2013. Israel and Egypt were today urged to renounce chemical weapons, especially after Syria joined a convention banning them, the chief of an international arms watchdog said. “Now since Syria has become a member country, I think (Israel) can reconsider,” Ahmet Uzumcu, head of the Nobel Peace Prize-winning Organization for the Prohibition of Chemical Weapons (OPCW), told Reuters. Israel signed the convention in 1993 but never ratified it. The state, which holds an observer status at the OPCW, has never publicly admitted having chemical weapons. Intelligence Minister Yuval Steinitz said in September that Israel would be ready to discuss the issue when there was peace in the Middle East. Egypt has used chemical weapons in the past and some claim it is probable the country still holds stockpiles. The country employed mustard gas in the Yemeni civil from 1963 to 1967 and supplied Iraq with similar nerve agents in the 1980s. Though not confirmed, Egypt is also believed to have provided Syria with mustard gas in the 1970s. North Korea has also come under pressure from the OPCW to sign the convention. Uzumcu said Angola, Myanmar and South Sudan were also preparing to join the pact. The OPCW has come center stage this year after Syrian President Bashar al-Assad agreed in September to give up his country’s chemicals weapons stockpile. The decision was largely made to avert the threat of U.S. missile strikes following al-Assad’s regime use of sarin gas in an attack that killed hundreds of people outside the capital Damascus. “The only consolation is that those attacks led to renewed efforts by the international community to eliminate them,” Uzumcu told Reuters, referring to chemical weapons around the world. While the United States came forward last week to take responsibility in destroying some of Syria’s chemical weapons on one of its ships, it was unable to find a Mediterranean port for the process. The OPCW hopes to remove all chemical weapons from Syria by Feb. 5, 2013 and to destroy them by June 30. The U.S. will reportedly cover the costs of the first two categories of weapons that require immediate attention, the price of which hovers around 35 to 40 million euros. The 500 tons of chemicals considered the most dangerous will also be processed by the United States and stored at an undetermined location. The OPCW is at risk of missing its postulated Dec. 31 deadline to remove Syria’s chemical weapons. A Free Syrian Army fighter runs to avoid snipers loyal to Syria’s President Bashar al-Assad in old Aleppo December 3, 2013. Syria’s largest Islamist rebel force seized a crossing on the Turkish border Tuesday from other rebels, including brigades loyal to the Western-backed Free Syrian Army, a monitoring group said. The Syrian Observatory for Human Rights said the Islamic Front, a new grouping of the most powerful Islamist rebel groups battling to overthrow President Bashar al-Assad, seized the Bab al-Hawa crossing in northwestern Syria. 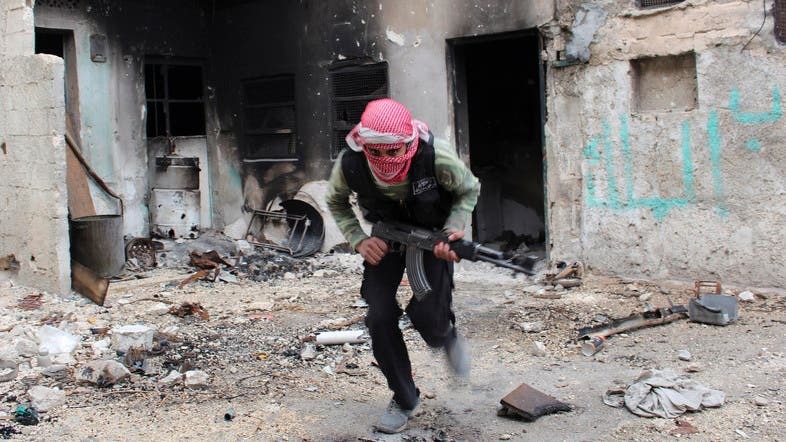 The capture came after the Islamic Front seized arms depots near the crossing belonging to the Free Syrian Army at the weekend, heightening tensions among the fractured Syrian opposition. Last week the Islamic Front rejected the authority of the FSA, which was the first major rebel force formed after the outbreak of Syria’s civil war and was made up of army deserters and civilians. The Islamic Front was formed last month by six rebel groups that merged with the goal of overthrowing the Assad regime and establishing an Islamic state. It does not include al-Nusra Front or the Islamic State of Iraq and the Levant (ISIL) — two jihadist rebel groups linked to al-Qaeda. [Wednesday, December 10, 2013] Marking The Universal Declaration of Human Rights (Adopted by the UN on December 10 1948), the Palestinian Prisoners Society (PPS) has reported that Israel is ongoing with its serious violations, and is currently holding captive more than 5000 Palestinians, including 200 minors and 15 women. The PPS said that Israel continues to violate all related international agreements, including the Fourth Geneva Convention, by subjecting the detainees to cruel conditions, extreme torture and abuse, and holding them under terrible conditions. It added that this year witnessed some of the largest violations against the detainees, as Israeli soldiers repeatedly broke into their rooms in different detention camps and prisons, and violently assaulted them, in addition to spraying them with gas and forcing dozens into solitary confinement. The Society said that four Palestinian detainees died this year, three of them died in prison due to the lack of medical attention, and one died shortly after his release due to serious illness he suffered while in prison, and was never granted the urgently needed medical attention. There are currently 1400 Palestinian detainees suffering with various health conditions, including 150 suffering with cancer, diabetes and other serious health issues. Most of the detainees who suffer with serious health conditions are held at the Ramla Prison clinic that lacks basic supplies and specialized physicians. The PPS further stated that, after Israel released veteran detainees held before the First Oslo Agreement of 1993, there are currently 53 veteran detainees still imprisoned, out of 104 detainees who spent at least 20 years in prison. The PPS called on the International Community, and Human Rights groups, to act on holding Israel accountable for its crimes against the Palestinian people, especially against the detainees who are supposed to enjoy protection and adequate treatment. Last month, the Israeli government said it was considering forcing Palestinian detainees from Jerusalem and Historic Palestine (1948) into exile, should they be freed under any agreement with the Palestinian Authority. The detainees have also been imprisoned since before the First Oslo Agreement. Tel Aviv refused to release any of the 27 detainees during the first and second phases in which it released, back in mid-August 26 veteran detainees (14 from Gaza and 12 from the West bank, and in late October when it released 26 veteran detainees (21 from Gaza and five from the West Bank). More veteran detainees are expected to be released on December 29 and on March 28 2014, as part of a mediated deal reached by the US to ensure the resumption of direct political talks. Various Israeli officials of the Israeli Government of Benjamin Netanyahu have been calling for voiding the agreement. BETHLEHEM (Ma’an) — Two Palestinian girls were injured Tuesday morning in a hit-and-run accident on the main road between Beit Jala and al-Walaja west of Bethlehem. Eyewitnesses told Ma’an that two teenage Palestinian students on the road were hit by an Israeli settler who was driving to Jerusalem. (Reuters) – More than 170 Syrian and Palestinian refugees held since October in Egyptian police stations were released on Tuesday and granted temporary permits to stay in Egypt, a government spokesman said. Egypt tightened its open-door visa policy for Syrians fleeing civil war soon after the army toppled Islamist President Mohamed Mursi in July. Arrests and deportations of refugees, some of whom had not formalised their stays, followed. The refugees released on Tuesday had been trying to leave Egypt illegally by boat when authorities detained them. Foreign Ministry spokesman Badr Abdelatty said 171 of 206 Syrian and Palestinian “illegal immigrants” had been granted three-month visas, while the cases of the remaining 35 still in detention were under review. Authorities have apprehended about 1,500 Syrian refugees in the last few months and about 1,200 of them have been “coerced to leave”, according to Human Rights Watch. Although courts had ordered the release of all 206 Syrians and Palestinians in detention, the authorities had previously said they were still being held for immigration violations. In one police station, dozens of refugees staged a hunger strike last month to draw attention to their plight, but called it off after 10 days. About 300,000 of the 2.3 million refugees fleeing Syria went to Egypt, where they were received warmly during Mursi’s year in office. His removal changed the atmosphere, with Egyptian media accusing Syrians and Palestinians of being Mursi supporters. The United Nations refugee agency says Egypt has refused to let it register Palestinians from Syria as refugees and give them the yellow card that allows them temporary residence. Tamara El Rifai of Human Rights Watch said the U.S.-based group welcomed Tuesday’s release, but called for the government to allow UNHCR to register the Syrians of Palestinian origin. “We are looking for a concerted solution between the authorities, the U.N., and other countries willing to step up,” she said. The extent to which US President Barack Obama tried to get Americans into “another war for Israel” in Syria” is “concerning,” a political commentator tells Press TV. “It’s very concerning that President Obama went to the extent that he did to get us into another war for Israel versus Syria,” James Morris, editor of America-hijacked.com said in a phone interview on Monday. He made the comments as distinguished American investigative journalist Seymour Hersh says in his recent article that Obama did not tell the whole story about a chemical attack near the Syrian capital, Damascus in August. “President Obama had basically cherry-picked intelligence, according to Seymour Hersh’s article, to get a war with Syria underway,” Morris said. In a televised speech on September 10, Obama accused the Syrian government of carrying out a chemical attack which killed hundreds of people including women and children. The president made the case for a military action but backtracked when British lawmakers voted against it and Russia made a proposal to put the Syrian chemical weapons under international control. Morris said that US wars in the Middle East have all been designed to protect the interests of Israel. “The problem now is Israel lobby has so much influence over the President Obama administration and the Congress, that they were just dying to get another war for Israel going into Syria and you had a media that was complicit with that,” Morris said. WEST BANK, (PIC)– The Israeli occupation forces (IOF) at dawn Tuesday kidnapped nine Palestinians from different areas of Al-Khalil and Bethlehem cities, south of the West Bank. Local sources said that Israeli troops stormed some homes in Yatta town, south of Al-Khalil, and kidnapped Hani and Ziyad Makhamra and two others in Beit Ummar town to the north. They added that another young man named Rami Abu Zainab was taken prisoner in Dura town. In Bethlehem, the IOF raided at two o’clock in the morning Al-Deheisha refugee camp and clashed with its young men. According to eyewitnesses, the Israeli military campaign in the camp lasted until five o’clock at dawn and ended with the kidnapping of four young men. In an earlier incident, the IOF raided last night the towns of Zababda and Masliya, east of Jenin city, and kidnapped two young citizens identified as Anwer Kamil and Wael Lahlouh. A demonstration outside the Haifa courthouse after the Shefa Amr seven were sentenced, 28 November. If further proof was needed that the courts are an integral part of Israel’s apartheid system, it was in abundance in a Haifa court last month. Six Palestinian men have been handed prison sentences of up to two years each over the 2005 killing of an Israeli soldier who opened fire on a bus full of civilians in Shefa Amr, a city in the Galilee region of present-day Israel. A seventh man has been given a suspended sentence of eight months. The court case, which concluded last month, demonstrates that Jewish and Palestinian citizens of Israel are treated differently by the the authorities. Considerable effort was made to protect the reputation of Eden Natan Zada, the Israeli soldier who opened fire on the bus, murdering the driver and three passengers. The prosecution refused to label him a “terrorist” because using such a label would “disgrace the deceased,” as the Israeli daily Haaretz reported. The Palestinians who tackled Zada and prevented him from inflicting an even higher death toll were, on the other hand, depicted as inherently violent. The court refused to accept the obvious that those who confronted Zada were responding to his unprovoked acts against innocent civilians and were trying to defend their community. Judge Ilan Schiff claimed that Israel “cannot tolerate acts of retribution,” the Times of Israelreported. His words smacked of hypocrisy; Israel has frequently argued that its attacks onGaza’s women and children were in retaliation for rockets fired from the Strip. For years it punitively destroyed the homes of family members of Palestinians suspected of armed resistance. Despite recognizing that Zada killed his victims “simply because they were Arabs,” Schiff effectively rubber-stamped requests from the Israeli state, which had sought the accused be imprisoned for up to nine years. Schiff only departed from that request by taking account of how the trial had lasted for eight years when deciding how long the men would be locked away. “We face this discrimination in all aspects in our lives as the Palestinian minority in a Jewish state, whether in education, residency, civil rights or even the right to defend our own lives,” he said. Had this been a case of Israelis killing a Palestinian in self-defense, it would more than likely have gone unpunished. We know this from bitter experience. No criminal charges were brought against a Jewish Israeli taxi driver who along with policeshot a Palestinian who allegedly struck an Israeli police car and a bus with his bulldozer in Jerusalem during 2009. The Palestinian man, a construction worker, died of his wounds. This double standard was also the case with the killing of the perpetrator of a deadly attack on a yeshiva in Jerusalem in 2008 — a precedent raised by the Shefa Amr defense attorneys in court. The Palestinian gunman who slay eight was shot in the head by student Yitzhak Danon; Danon along with Israeli soldiers then fired repeatedly into the man’s body for ten minutes. “Five hundred or 600 bullets were fired,” according to one witness. No charges were filed against Danon, who was celebrated in the media as a national hero. Morad Haddad, an elected member of the Shefa Amr municipality, told The Electronic Intifada that nobody was surprised by the Haifa District Court verdict. “In a way, there is a positive side to this verdict. It shows the true face of the Israeli government towards the Palestinian citizens of its country. BETHLEHEM (Ma’an) — A Palestinian policeman was killed after unknown assailants attacked a police station in Tuqu village southeast of Bethlehem late Tuesday, medics said. A Bethlehem emergency spokesman said Naser Othman Brewish, 23, from Beit Kahil in Hebron, was shot in the chest. He was taken to a clinic in Tuqu before an ambulance took him to Beit Jala governmental hospital where he died. Bethlehem Gov. Abudlfattah Hamayel told Ma’an that a group of men fired at security forces in Tuqu police station, striking one officer. The governor connected the event to what he termed an “unfortunate incident” on Monday when a man was shot dead by Palestinian Authority police. He said the incident was under investigation, and that the probe had the support of the victim’s family. The victim’s family “told us that it appreciates and trusts the committee,” of inquiry, Hamayel said. He added that security forces would not permit attacks on police stations.